For the crème brûlée, preheat the oven to 120C/250F/Gas ½. Bring the milk and lemon verbena sprigs to the boil in a pan. Remove from the heat and set aside to cool and infuse, then discard the lemon verbena sprigs. In a bowl, whisk together the egg yolks and caster sugar until pale, fluffy and well combined. Add the cooled milk and cream to the eggs and sugar mixture, whisking continuously until the mixture is smooth and well combined. Strain the mixture through a sieve, then divide it equally among four ramekins. Place the ramekins onto a baking tray. Transfer the crème brûlées to the oven and cook for 1½-2 hours, or until the crème brûlée mixture has set but still has a slight wobble. Meanwhile, for the poached pears, place the pears, lemon peel, lemon juice, 150g/5oz of the caster sugar, the vanilla pod and vanilla seeds into a pan. Add enough water to just cover the pears. Bring the mixture to the boil, then reduce the heat to a simmer and simmer for 12-15 minutes, or until the pears are tender. Remove the pears from the pan using a slotted spoon and set aside to drain on kitchen paper until cool. For the spelt shortbread, increase the oven temperature to 180C/350F/Gas 4. Place the butter and flour into a bowl and rub together using your fingertips, until the mixture resembles breadcrumbs. Add the sugar, salt and vanilla extract and stir well until the mixture comes together as a soft dough. Roll out the dough onto a lightly floured work surface to a thickness of 0.5cm/¼in. Cut 5cm/2in discs from the shortbread pastry using a cookie cutter or an upturned cup. Place the shortbread discs onto a baking try and prick several times with a fork. Chill in the fridge for 30 minutes. When the shortbread has chilled, transfer it to the oven and bake for 18-20 minutes, or until pale golden-brown and firm to the touch. Set aside to cool on the baking tray. 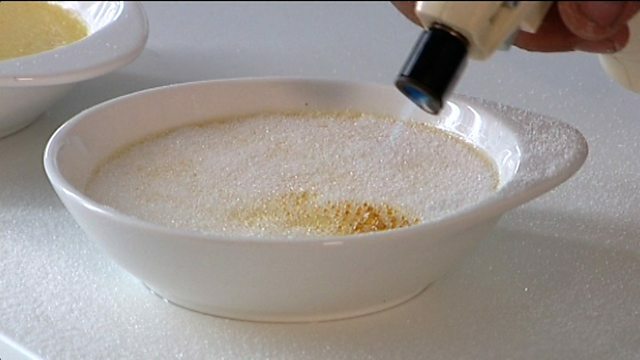 Just before serving, sprinkle the remaining 75g/2¾oz of caster sugar onto a plate. Roll the drained poached pears in the sugar, then heat all over using a chefs' blow torch until the sugar has caramelised. Sprinkle a little demerara sugar over the surface of each crème brûlée and use a chefs' blow torch to heat the surface until the sugar has caramelised. To serve, place one crème brûlée onto each of four serving plates. Place a piece of shortbread alongside. Place a caramelised poached pear onto each shortbread biscuit.